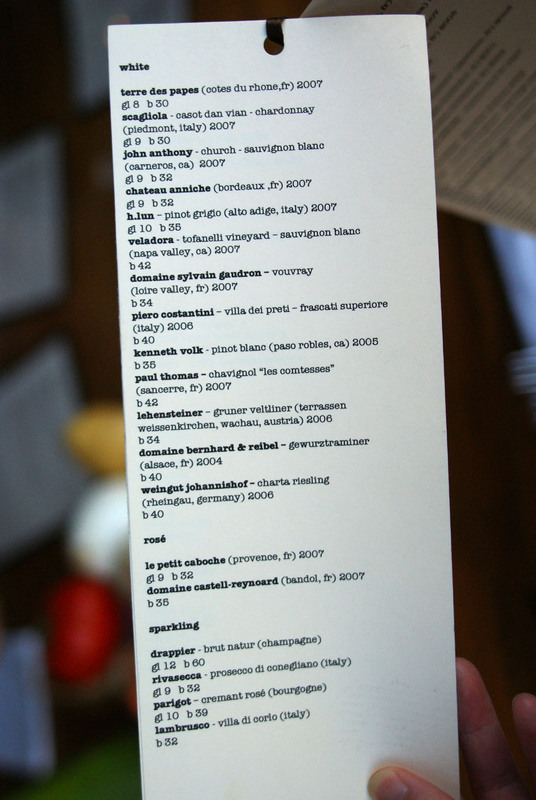 My last post covered the 5x5 Chef's Collaborative dinner at Providence. At that meal, Chef Cimarusti and I talked briefly about Canelé, so it's sort of an interesting stroke of coincidence that my next post would be about the place! 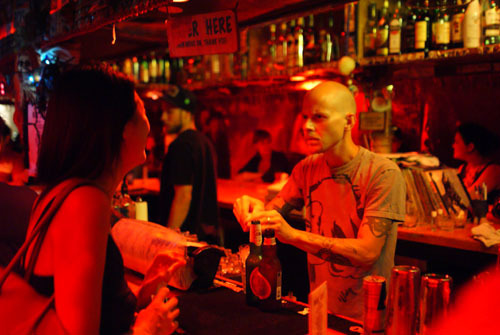 I was brought here by Aaron of Food Destination, who is organizing a series of dinners to commemorate his departure from sunny Los Angeles to the mean streets of upper Manhattan. Also attending were Christine of Folie à Choisauce, Danny of Kung Food Panda, Fiona of Gourmet Pigs, Josh of Food GPS, and Matt of Mattatouille. Canelé represents the joint efforts of partners Chef Corina Weibel and General Manager Jane Choi. Weibel had previously worked at such notable establishments as Campanile and Lucques, and with Canelé, she puts forth unfussy, unpretentious fare served in an honest neighborhood setting. Choi, on the other hand, hails from New York, where she ran the show at French eateries Balthazar and Pastis. 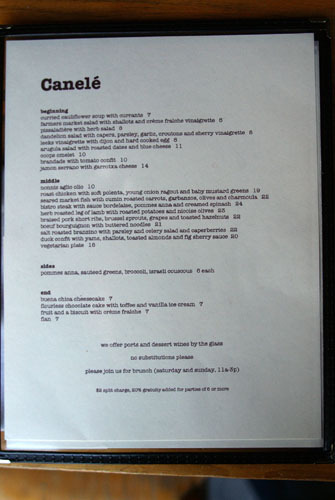 Located on the site of the former Osteria Nonni, Canelé is situated in the quaint northeastern LA neighborhood of Atwater Village. Parking is street, and can be tough to secure on Glendale Blvd; try the nearby residential side streets instead (I parked on Brunswick Ave). 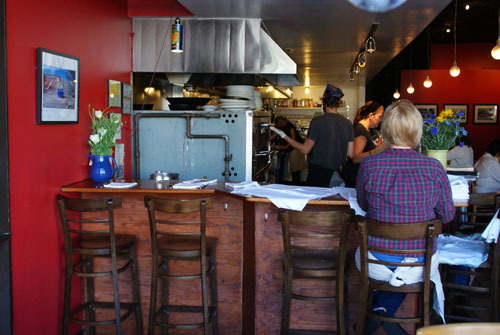 The interior is simple, unassuming, and inviting, consisting of a bar (where you can get a good glimpse of the kitchen), a small dining room, and a communal dining table out in front (note: no reservations are taken). 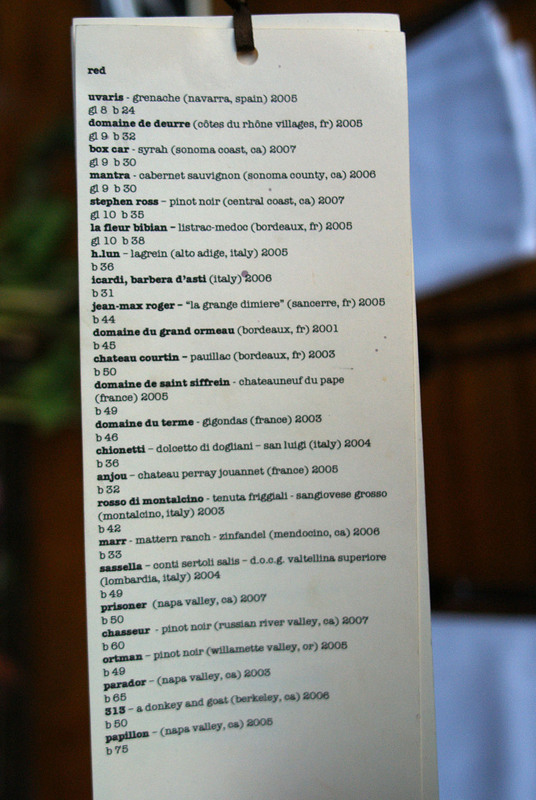 The menu can be seen written on a large chalkboard. 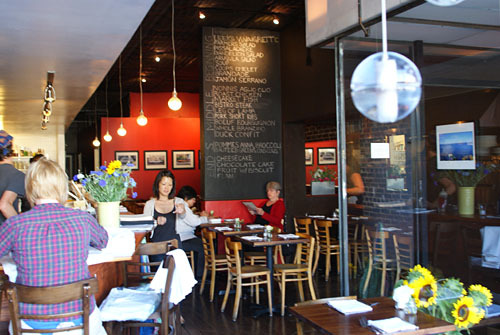 Canelé features seasonal Mediterranean-inspired fare accented by Cal-French influences. 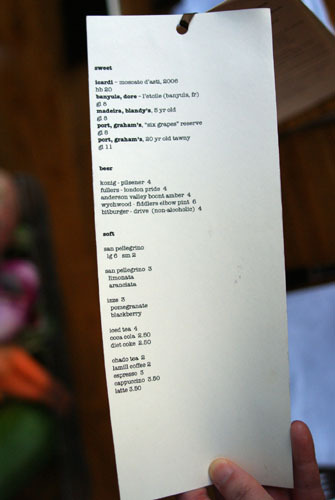 The menu is small and focused, but still allows for plenty of variety. In addition, the restaurant is now featuring $22 three-course prix fixe options Tuesday through Thursday; these are simpler menus, focusing heavily on comfort foods. There was also an appealing selection of daily specials, announced by our server. Click for larger versions. 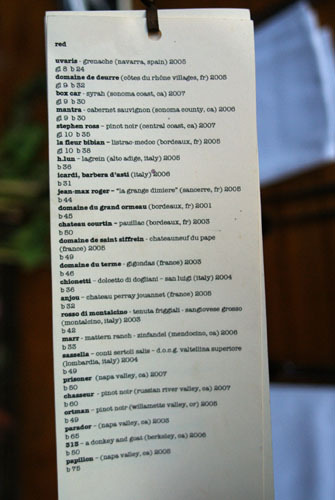 Much like the menu, the wine list is short, yet sweet, featuring high-quality, value-conscious selections from lesser-known producers. Corkage is only $10. Click for larger versions. 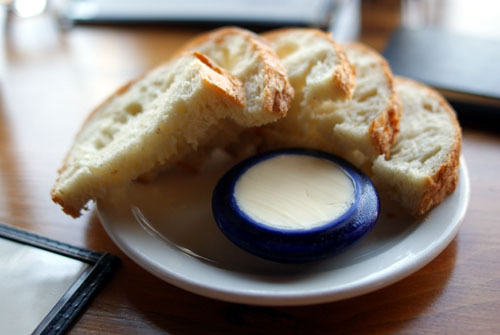 Bread and butter were competent but unremarkable. Christine had mentioned her preference for Syrah, so I pulled a bottle of the 2004 Shafer Relentless Syrah from my cellar. A blend of Syrah and Petite Sirah, the wine had a remarkably powerful, aromatic nose of dark fruit that was detectable from across the table. On the palate, I noted bold, brash notes of dark berries, raisin, rock, and spice, all finishing slightly hot and subtly tannic. Note the service using Riedel's "O" series of stemless glassware. 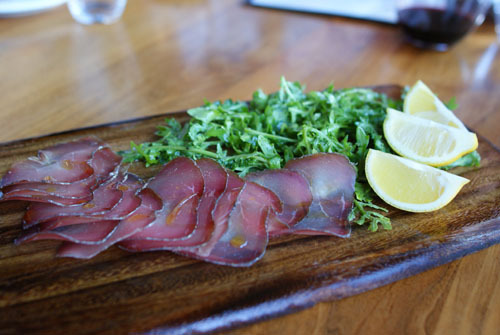 To start, were brought a platter of bresaola, basically salted, cured, and dried beef. It was served in a traditional manner, paired with olive oil, arugula, and lemon. The olive oil drizzle heightened the richness and gravity of the meat, but the use of arugula (or rocket, as Aaron prefers to say) took the bresaola to another level, with the bitterness of the greens providing a superb contrast to the beef. 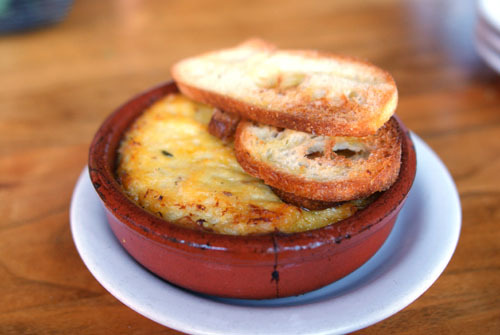 Brandade simply refers to a purée of salt cod, olive oil, and milk. 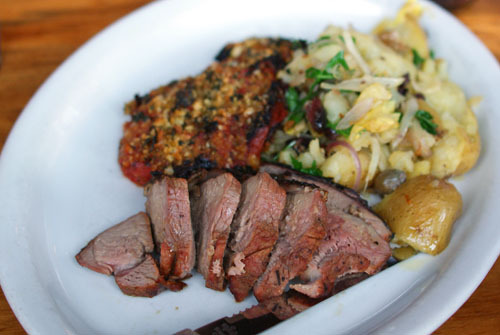 Garlic and potato can also be added, as was the case recently at Church & State. Here, the cod, eaten alone, was delicate in flavor, with a nice, lingering saltiness on the finish, but fairly heavy. The brandade was paired with a tomato confit, which provided a sweetness to cut through the richness of the dish; however, I felt that the sweetness was almost too jarring in this instance. 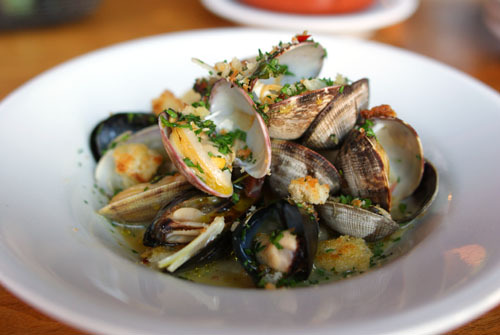 Here, we have a classic preparation of mussels and clams, one of the better variations I've had in recent memory actually. The mollusks were done such that their natural, briny flavor was still intact, but not overpowering. Rather, their taste went superbly with the garlicky broth, and they even had a slightly spicy finish. Aaron was keen on pointing out the superiority of this preparation vis-à-vis that which we had recently at Pizzeria Ortica. We have here what amounts to a pâté de foie gras, served with a sweet cherry compote, arugula, and toast. The liver by itself was actually surprisingly mild, and thus the sweet compote really provided a great complement, reminding me a bit of the foie gras terrine at XIV. Experiencing the foie with the arugula was enjoyable as well. This asparagus special turned out to be my favorite appetizer. The asparagus itself had great consistency and a crisp, subtly biting flavor. 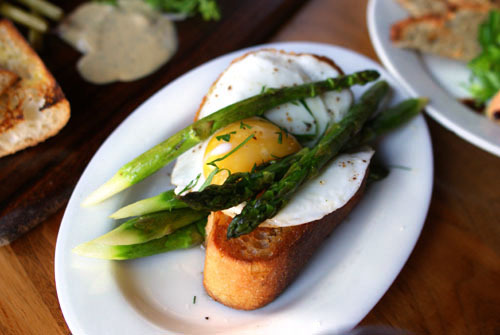 The key though was the egg, which provided a rich, creamy contrast to foil the sharpness of the asparagus. I actually found the bread unnecessary. The terrine, taken alone, was uninspiring. However, when eaten with the tangy caraway sauce, the amalgam was simply superb, with the sauce drawing out flavors and really adding a fantastic complexity to the dish. 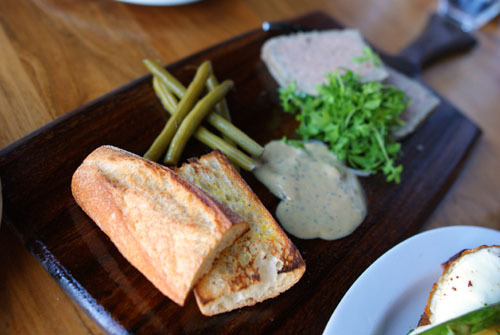 Interestingly, Aaron compared the terrine's consistency to that of "tuna salad!" 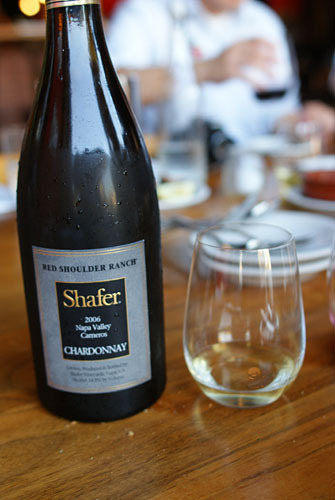 With the starters dispensed with, we decided to pop a bottle of 2006 Shafer Red Shoulder Ranch Chardonnay, also from my stash. 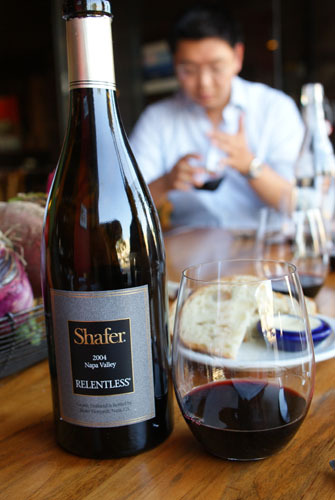 A great wine, the Shafer had a pronounced, fruity bouquet punctuated by hints of apple. This continued onto the palate, where it was joined with by a crisp minerality, notes of stone fruit, great acidity, and just a touch of spice. It was powerful, yet elegant--overall a very balanced, very good wine. Unlike with the appetizers, we ordered our own entrées. My selection was the branzino, or European seabass, which Christine also picked. The fish's flesh was nicely tender and juicy, but not overly oily, with a flavor that was actually quite mild. 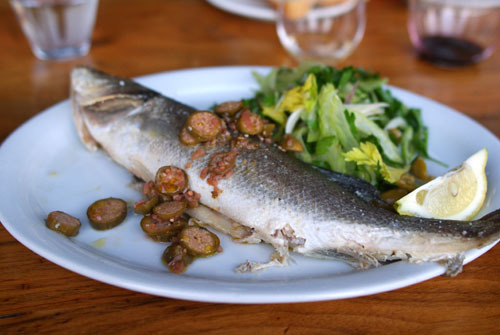 The branzino's delicate saltiness was complemented nicely by the zesty caperberries and tangy salad. Excellent with the Chardonnay. Ordered by Aaron and Danny. I was able to sample a small piece of the meat only here. I noted a pleasing, tender consistency and an enjoyable, though slightly nondescript, flavor--it wasn't gamy at all. We all thought that it would've been better had it been cooked a bit rarer. Probably my favorite main course, the short ribs possessed a flesh that was tender and fatty but not overwhelmingly so. It went superbly with the Syrah. As much as I enjoyed the pork, I think I liked the Brussels sprouts even more; their bitterness was fantastic in tempering the weight of the ribs. Matt was the one who had this. Fiona and Josh had the duck. I was only able to taste a few small slivers of meat. From what I could gather, it seemed like a fairly standard preparation--good but nothing to write home about. Moving on to dessert, flourless cakes are usually very dense, so this version was actually a bit lighter than I expected, though it was still very rich, and very chewy. Chocolate and ice cream is a textbook pairing, but it works, with the vanilla ice cream balancing the over-the-top sweetness of the cake. 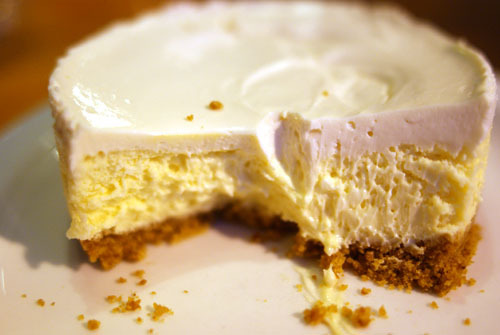 The cheesecakes here are individually made in small portions. 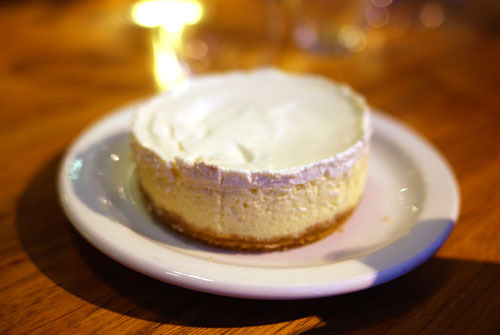 The example here had a hint of lemon over a base of creamy, custard-y cheese; it was dense, but not too heavy. For me though, the best part was the crumbly crust. Don't ask me where the "buena chica" comes from. 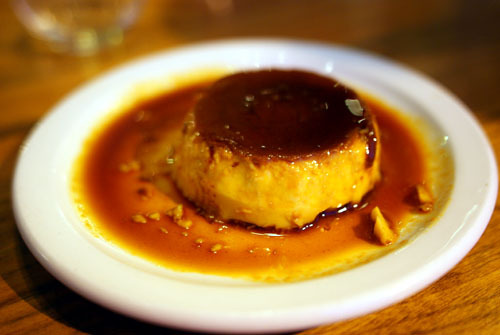 Flan, or crème caramel, consists of a rich custard base topped with caramel. As such, this was a prototypical example of the dessert. Not very interesting, but tasty. This was a special dessert, but unfortunately I don't recall the exact name. 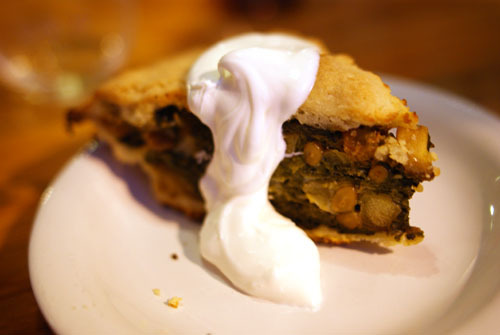 In any case, it was made with an intriguing array of ingredients: Swiss chard, spinach, raisin, apple, and crème fraîche. As you can imagine, it had an "interesting" flavor that was a combination of sweet and savory. I didn't love it, and actually found it rather disconcerting to eat. 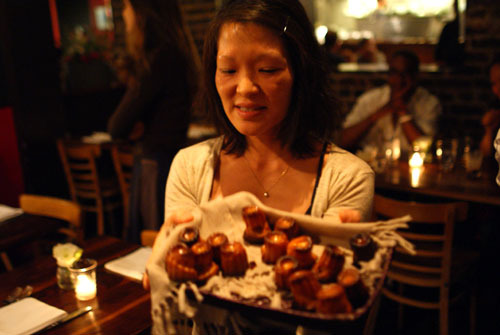 At the end of the meal, Jane Choi presented us with a tray of canelés. 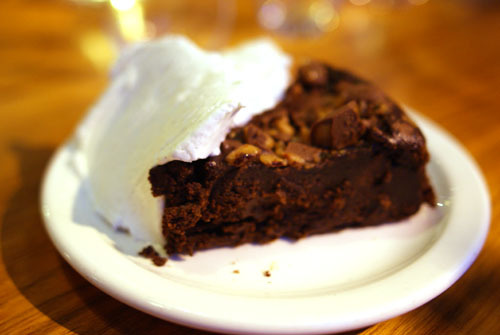 A dinner here just wouldn't seem complete without sampling the restaurant's namesake pastry. 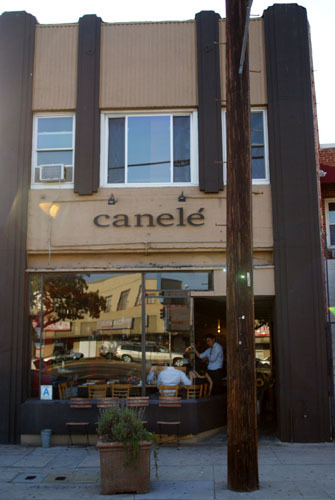 Michael Cimarusti described the food at Canelé as "good" and "simple." I agree on both those accounts. I wouldn't come here to be blown away. Rather, come for uncomplicated but deftly-prepared fare, made using fresh, seasonal ingredients; come to experience the warmth of the staff and of your fellow patrons; come for the friendly "neighborhood" feel. 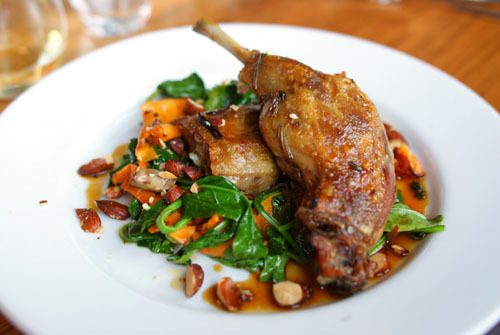 Canelé is Mattatouille's favorite restaurant; I can sort of see why now. After dinner, we parted ways with Josh and drove down the street to Silverlake Wine (2395 Glendale Blvd, Los Angeles, CA 90039; 323-662-9024). Much to my surprise, the place was positively buzzing when we arrived. 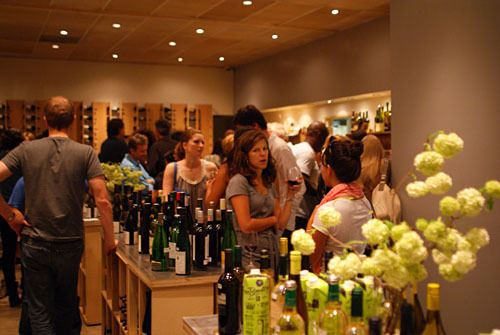 After grabbing some Li'l Merri's from Cake Monkey and a duo of wines, we staked out a corner in the back. 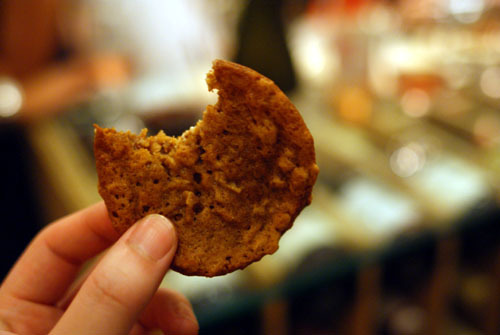 The Li'l Merri's are basically oatmeal cookies sandwiched with maple vanilla buttercream--phenomenal. The first bottle we chose was the 2008 Charles & Charles Syrah Volume II Talcott Vineyard. 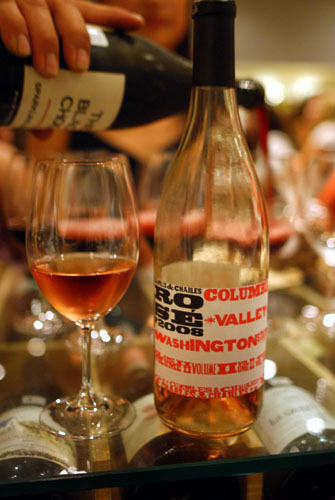 A 100% Syrah wine from Columbia Valley, Washington, it was pretty much everything I'd want in a still rosé--light, refreshing, and fruity. Next up was the Australian Black Chook Sparkling Shiraz. I don't have sparkling red wines very often, but perhaps I should! Very jammy and full-bodied, but with just enough bubbles to lighten the mood. 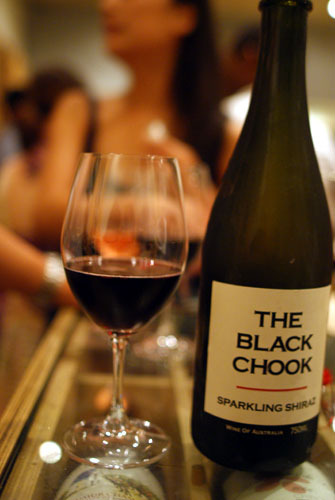 A fun wine, the Black Chook went wonderfully with the Li'l Merri's. 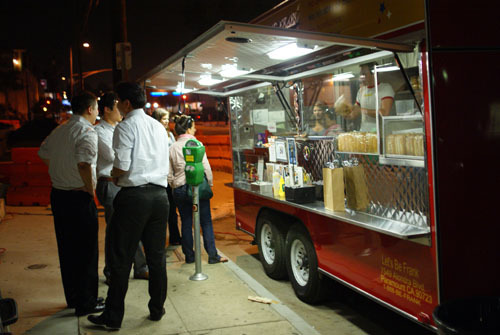 My main reason for coming to Silverlake wasn't necessarily the wine, but for the Let's Be Frank hot dog truck, which sets up shop Thursday nights from 5:00-10:30. 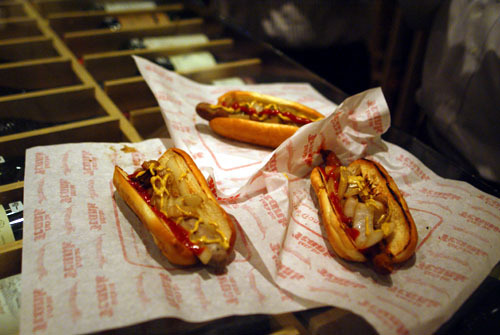 The truck was offering up three types of dogs: the Frank Dog (100% Grass-Fed Beef Dog), the Brat Dog (Family-Farmed Pork Dog), and finally, the "Hot" Dog (Spicy Family-Farmed Pork Dog). All were $5 each and came served on freshly baked buns with grilled onions and pickles; we also topped them with ketchup and mustard. 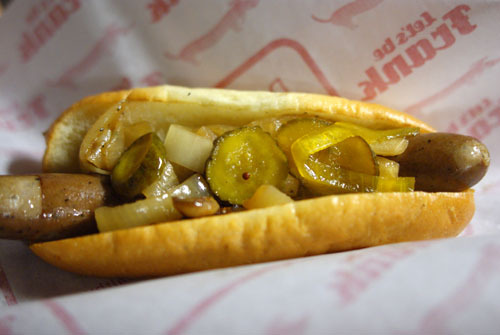 My favorite was the "Hot" Dog; its mildly spicy flavor was key for me, and the addition of tangy pickles and onions elevated the dog even further. 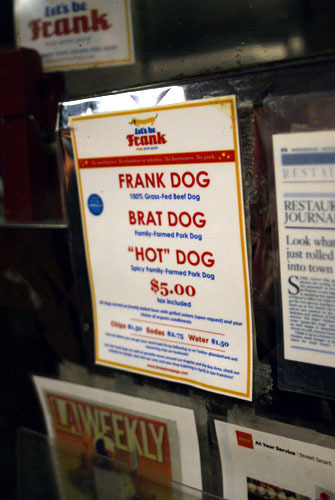 The Frank Dog, on the other hand, had the best snap, and was tops texturally. 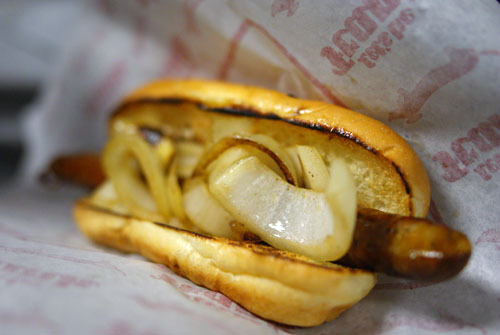 It was Aaron's favorite, though he still prefers Pink's or Wurstküche. 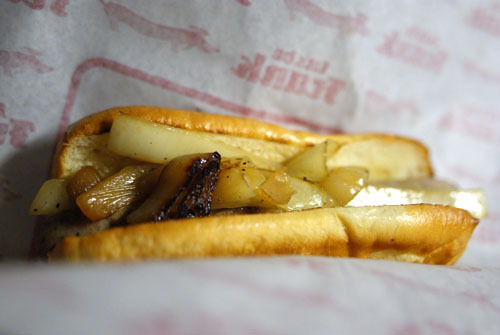 The Brat Dog, relatively speaking, was middle-of-the-road. To wash down the franks, beer was most certainly called for. 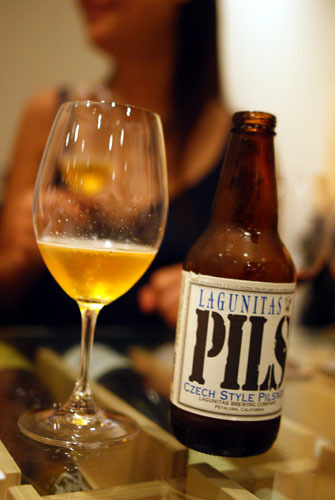 First up was the Lagunitas Pils, a Czech Style Pilsner from Lagunitas Brewing Company in Petaluma, California. What struck me about this beer was the aroma, which was immensely earthy and bready, with a touch of hops. The taste, meanwhile, was more subdued, with citrus, a mild hoppy bitterness, and a lovely amount of spice--crisp, clean, and very nice. 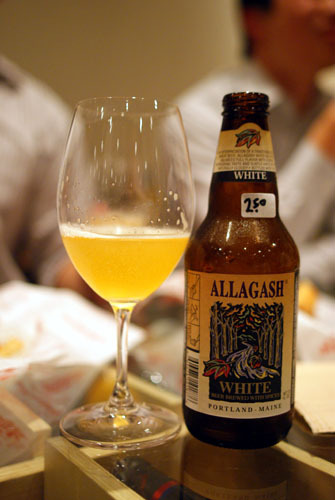 The second brew was the Allagash White from Allagash Brewing Company in Portland, Maine. This beer also had an amazing nose, filled with yeast, spice, and citrus. Those flavors continued onto the palate, where they were joined by a some vegetal notes--smooth, balanced, superb. 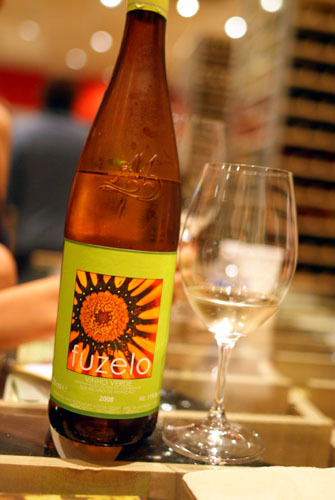 Finally, to wrap things up, we got a bottle of the 2008 Adega de Monção Vinho Verde Fuzelo. Really a quintessential example of the Vinho Verde style, it was light, refreshing, and fruity, with a marked acidity and effervescent body. A great summer wine--very quaffable! Fiona had left during our outing at Silverlake Wine, and Aaron took off afterwards. 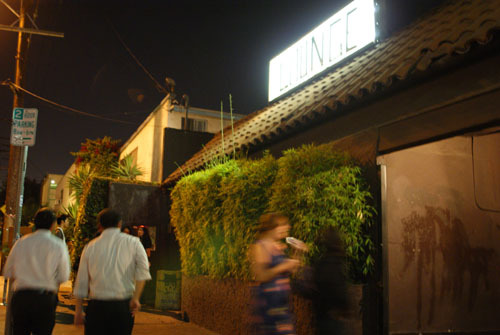 The remaining four of us walked down the street to Cha Cha Lounge (2375 Glendale Blvd, Los Angeles, CA 90039; 323-660-7595), described by Matt as "the hipster bar." 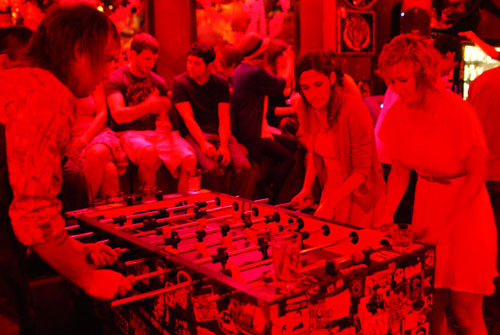 If I had to describe Cha Cha in one word, it'd be "red." Despite the promise of cheap PBR, I had a Stella for $5. Their Bloody Mary's (replete with pickled haricot verts) aren't bad, either. 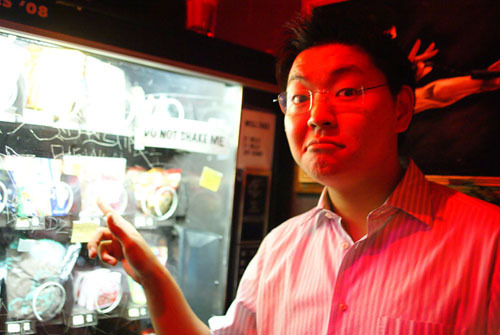 Here, we see Matt examining the Cha Cha's vending machine. 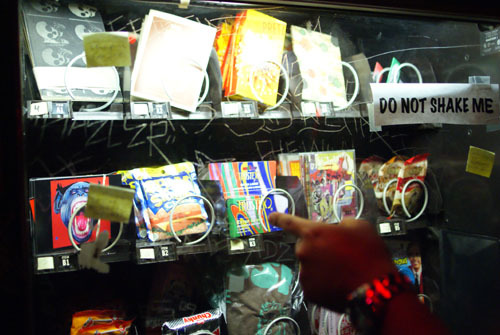 Despite some interesting selections, such as extra large condoms and novelty tampons, Matt opted for a mere Twix bar. 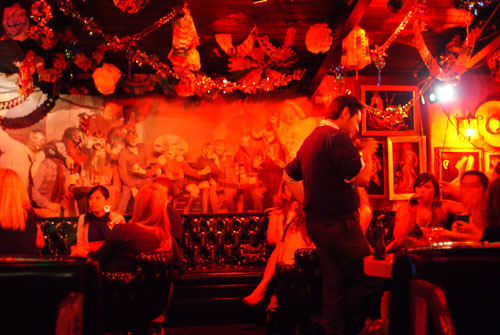 The most interesting thing about Cha Cha, I thought, was the photo booth. 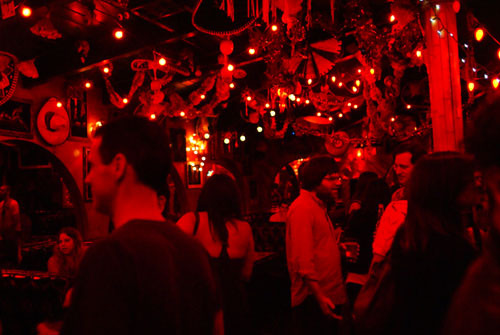 I failed to snap a photo of the actual booth, but for only $2, you can get four drunk photos taken. Sweet! I'm sleepless in Seattle and am now STARVING after seeing your photos. The short ribs at Canelé looked good, but I'm wanting one of those HOT DOGS. 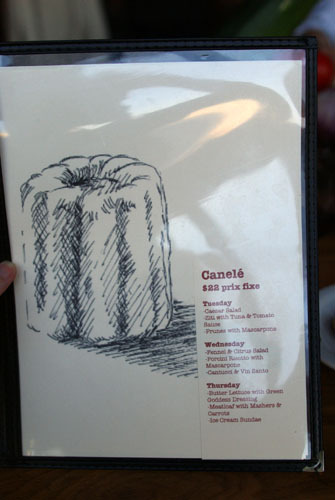 I love Canele, but was previously unaware of their pedigree. And kudos to the mgmt for springing for Reidel. What a foodfest! Canele looks so adorable, and I'm drooling over those short ribs. Lizzie: Yeah, I wasn't aware of its pedigree either before I looked into it. And though I prefer stems, I suppose the "O" series was fitting given the nonchalant nature of the place. Sharon: I was just expecting dinner at Canele. But from what I gather, most all of their events turn into "food marathons" of sorts! i want to see a close up of the photo booth pics!! 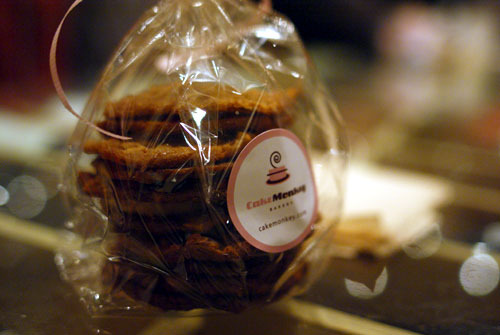 I'm glad you called Cake Monkey's cookies 'phenomenal'. It is pretty remarkable that you managed to post about Thursday night before jetting out of town. Nice job of capturing the experience. Canele has definitely improved since its early days. The only thing that disappointed me was the canele itself. and i'd advise not to post zooms of the photobooth or thus incur Christine's wrath. A mere Twix? Those things are heavenly at the right moment, and when you've got the munchies after some after-dinner drinks, they hit the spot. Because it was so hot in Cha Cha Lounge, they were slightly gooey and melted (gross but yum). 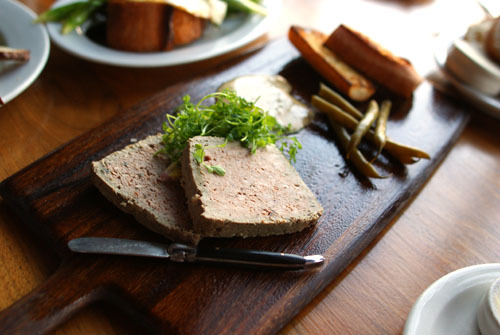 Duck liver pate does not equal foie gras. 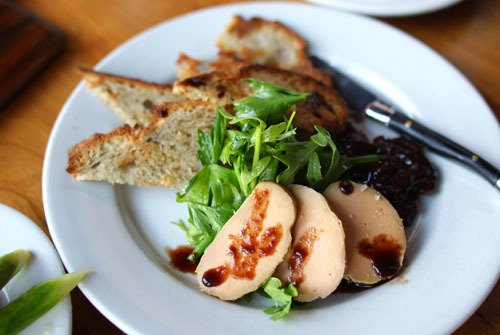 Was this foie gras, or just regular unfattened duck liver? I KEEEEL UUUUUU when u get back from chicago! 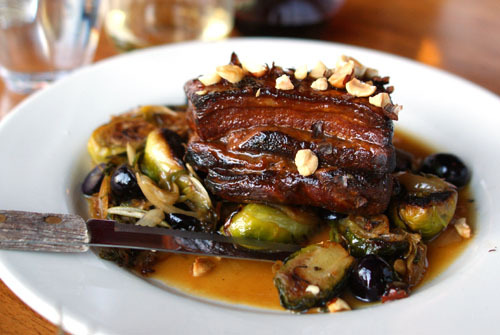 if you think about it, the braised pork short ribs at $22 is a bargain. that's why i love this place. also you should tag the posts with "Silver Lake Wine" and "Let's Be Frank" as well so readers will know that you went there from the get go. Haha, I should be more conscious of speaking to you in the future. It seems your remember all my observations as well as the ingredients for all our dishes. Thanks for coming out and thanks for bringing the wine. Let's go to Miami for stone crab, or St. Louis for ribs, or New Orleans for just about anything. Also, agreed with Matt. This is probably your best photo set so far. You're definitely coming into your own with that new camera. Vinh: It was a Thursday indeed. How did you meet Matt and Christine? Fiona: I was leaving for Chicago, so I wanted to have the post up. I don't have the necessary equipment to post while I'm on travel. Why are you glad that about the Cake Monkey cookies? They were damn good. 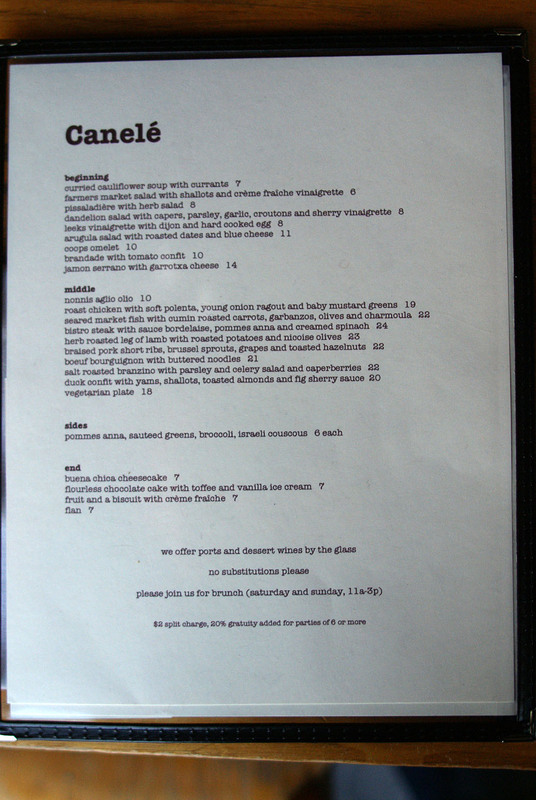 Josh: How ironic that the canele was the most disappointing item at Canele! I thought that they were passable. Matt: Don't they say that photography is 50% lighting (30% skill, 10% equipment, and 10% luck)? I seem to recall that old adage. I can thank luck for the sultriness of that last photo. Anonymous: That's a good distinction. We were throwing around the term foie gras but I don't think we got a definitive response from our server. Anyone who was there want to chime in on this? Christine: Why cringe? I think we all agree that that's a very becoming photo of you. Aaron: Aaron, I really appreciate your commentary; it adds some flair to the writing. Keep it up! I'm sure we'll eventually meet up somewhere out of state. I'd say photography is 65% "vision" or your concept/idea for the photo, 30% light, 4% skill/luck and 1% camera. Haha, totally arbitrary. As I said on Aaron's blog, the caneles are actually not the best that I've had. Try Bottega Louie's for a good version. They even had an orange-inflected one that's pretty delicious. oh ya, and have a blast in Chicago. We'll await your reviews! Matt: I'd posit that skill influences vision, so I'm not sure I'd separate the two. But, like you said, any such breakdowns are fairly arbitrary. Danny: I'm having a pretty good time in Chicago; it is really a great city, both culinarily and in general. Looking forward to trying those Canadian cookies! That is one heck of an evening!! 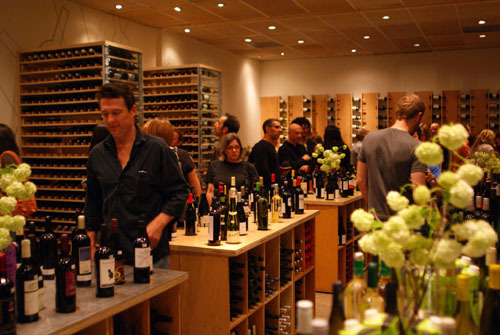 I was just at Silverlake Wine. Next time I will have to go on a Tursday to catch the hot dog truck.